* 20 and 21. 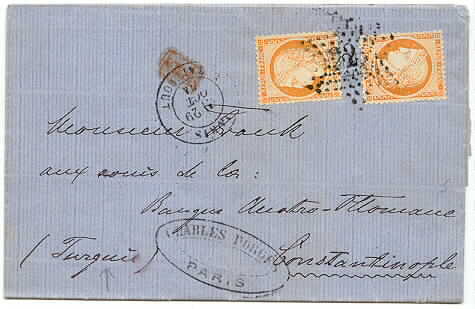 10 and 20 c Napoleon III - with numeral cancellation "1" on cover cancelled "Paris 27 dec 66" sent to Basel, Switzerland. * 28. 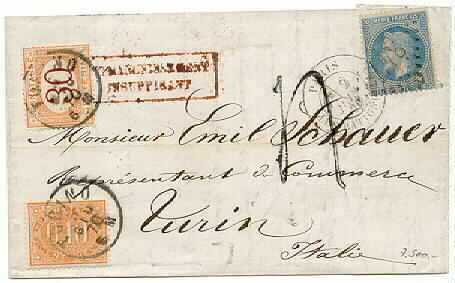 20 c Napoleon III - cancelled "Paris 2 Jun 76" on cover to Torino. 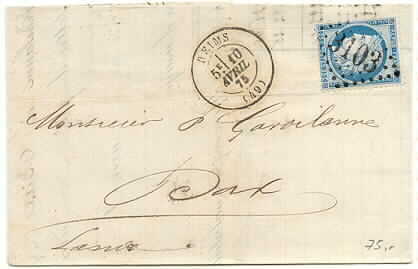 The cover has been underpaid and is supplied with 0.10 and 30 c italian postage due stamps cancelled "Torini 5 giu 70". * 42 and 43. 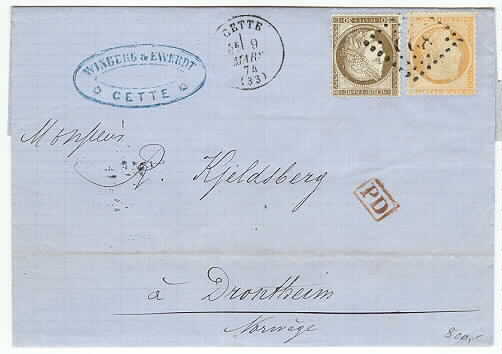 30 and 40 c Ceres with numeral cancellation "822" on cover cancelled "Cette 9 Mars 74" sent to Drontheim (Trondhjem), Norway. * 43. 40 c Ceres - two pcs. with numeral cancellation "22" on cover cancelled "Paris 29 oct 74" sent to Constantinople, Turkey. * 51. 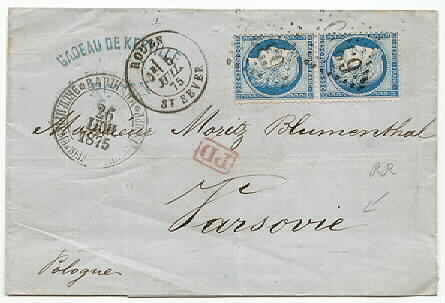 25 c Ceres - vertical pair with numeral cancellaton "6330" on cover cancelled "Rouen 5 juil 75" sent to Warsaw, Poland. * 51. 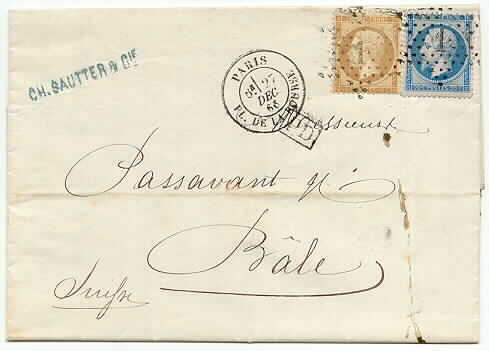 25 c Ceres - with numeral cancellation "2602" on cover cancelled "Nantes (26 mars 72)" sent to Libourne. * 51. 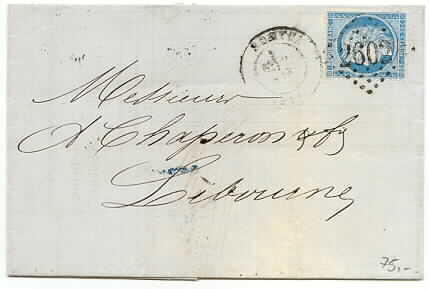 25 c Ceres - with numeral cancellation "3103" on cover cancelled "Reims 10 avril 75" sent to Dax. * 54. 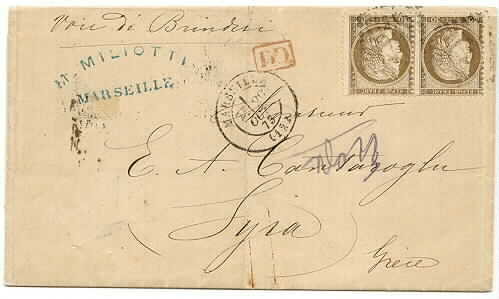 30 c Ceres - horizontal pair with numeral cancellation on cover cancelled "Marseille 29 oct 73" sent to Syra, Greece. * 151. 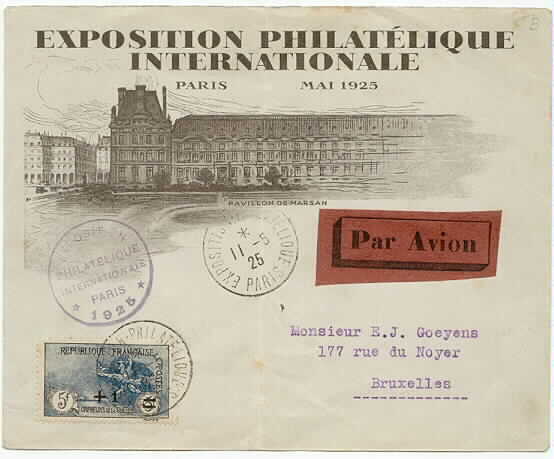 5 fr + 1 fr War Orphant's fund 1922 - cancelled "Exposition Philatelique Internationale Paris 11.5.25" on special cover sent by air mail to Bruxelles, Belgium.